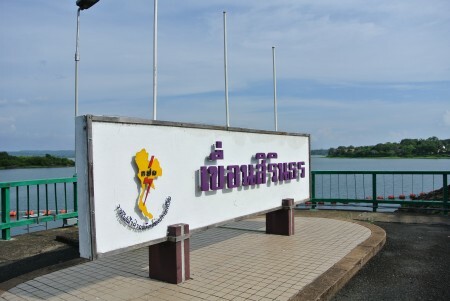 This Saturday morning we woke up at 6.30am, not because we were going crazy after two weeks in Thailand, but because we were going rafting at 10 at Sirindhorn Dam. 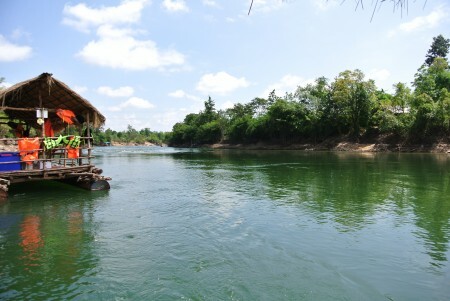 I had packed for rafting the night before and managed to put a few clothes aside for Chiang Mai. I managed to leave the room around 7.30 so that we could leave for the two-hour journey to the dam. 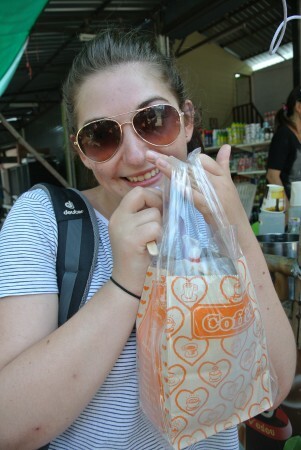 Because we had to leave so early, Aum had bought us breakfast at the market – along with food for lunch on the raft. Kate had heard that it might be spaghetti bolognaise, but it was even better than that. This morning we were introduced to pig on a stick! 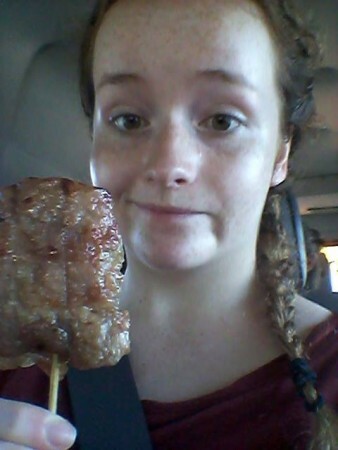 This is literally a bit of pork steak, stuck on a kebab stick and looks a bit like a savoury lolly. As much as Hannah passed up on breakfast, the rest of us dug in. It has to be one of the more peculiar things we have enjoyed while being here. When we finally got to the rafting place after napping through the two-hour journey, we had a little panic about the amount of flies around and covered ourselves from head to toe in mosquito repellent. I think they were just flies, but better to be safe than sorry. 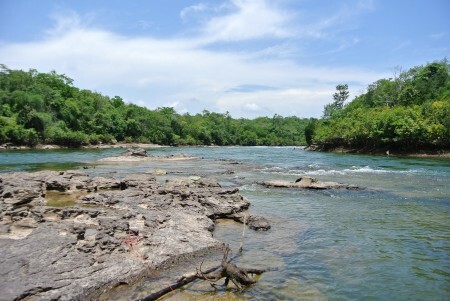 There were amazing views on the river. I had time to take some photos while the ice took ages to arrive. 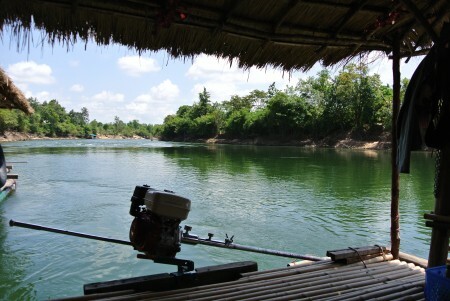 Once the ice arrived we cracked open a few Chang beers and started drifting down the river with a small crew steering the bamboo raft. 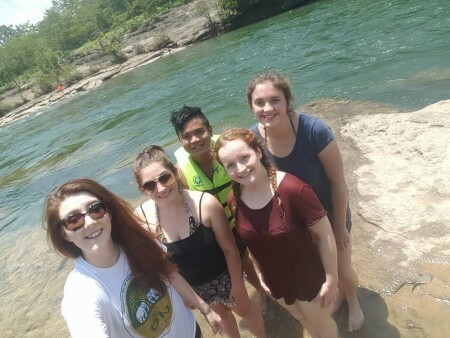 We stopped at some rocks about 20 minutes up the river and had a little paddle. We couldn’t go very far though because there were strong currents either side of the rocks. It was fun though and we even got a few selfies. We also made friends with some people in the raft next to us. 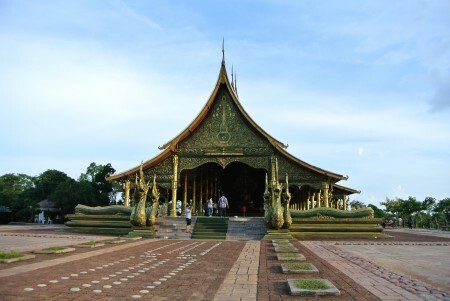 It turns out that they were also teachers in the Ubon Ratchathani province. We ended up taking photos with them. 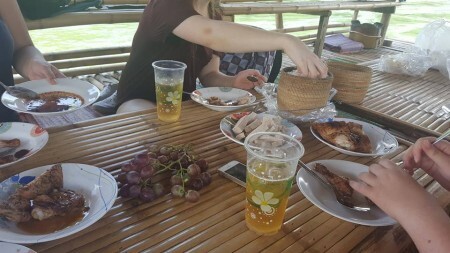 They were so nice they gave us some pork and grapes to have with our lunch! As a thank you we gave them some water melon. After lunch we went back in the water for a bit for a quick paddle. 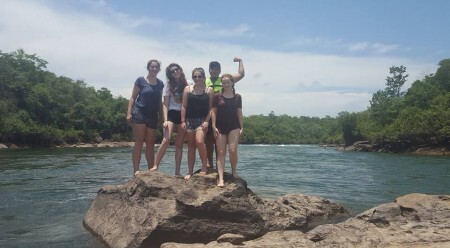 Then we donned some life jackets and jumped off the rocks (after taking pictures on said rocks) so that we could drift down the river back to the raft centre. It was so much fun. 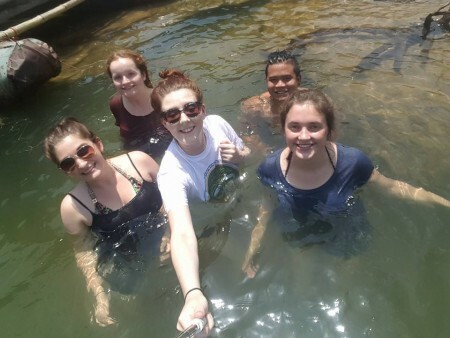 After changing in the men’s toilet shed (Kate and Eilidh were in the women’s toilet shed) we travelled to the Thia-Loas border to see the market there. 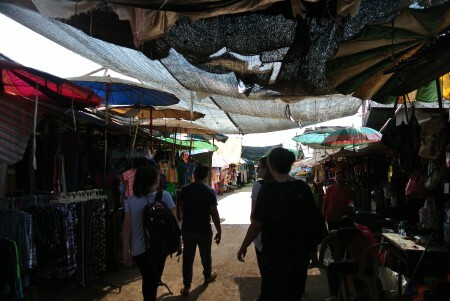 We couldn’t go over the border to see the market, as that would invalidate our visas, but we did take a look around the Thai side of the market. We looked at some of the clothes, they were nice, but they were so thick! I really don’t understand how anyone would be able to wear those clothes in this heat.We then got an ice lolly and Aum bought some Thai tea. The difference between English tea and Thai tea is that Thai tea is made from a powder and mixed with condensed milk, flavoured syrup and ice. It is then shaken in a tied plastic bag, pierced with a straw to drink it and then is placed in a paper bag. It didn’t taste like tea at all but it was nice and refreshing in the heat. 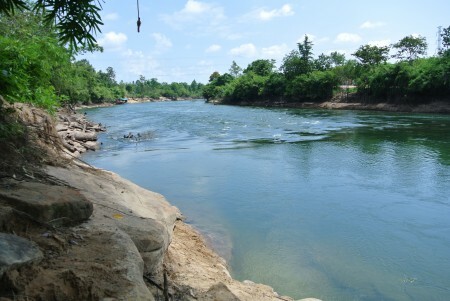 We wanted to leave the market because it was so hot so Aum got the driver to drive us to the actual dam of Sirindhorn. So we walked about for a bit trying to kill the three hours we had before sunset. The view from the dam was really beautiful. 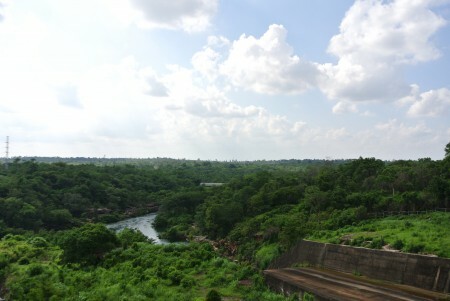 On one side it was full of trees with the river curving through the landscape. On the other side of the damn was a lake that looked really clear and blue – it could have been the ocean. 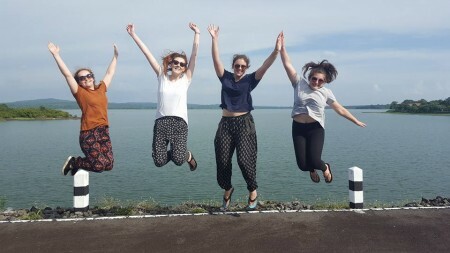 After taking some classic pictures of us having great timing and jumping together, we walked back to the car and drove to the temple Wat Sirintorn Wararam. 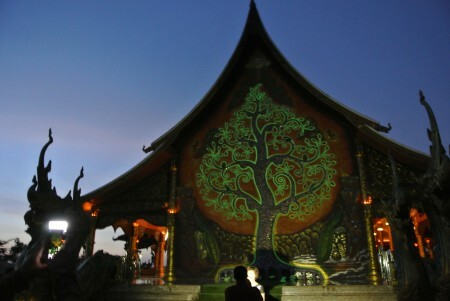 I was really looking forward to seeing the temple; the only problem was that we were two hours early as this temple glowed in the dark. So we napped in the air-conditioned van for an hour and then played 20 questions for the next half hour or so until the sun was beginning to descend. So we got out, found ourselves a bench and watched the sun set and finding weirdly shaped clouds. 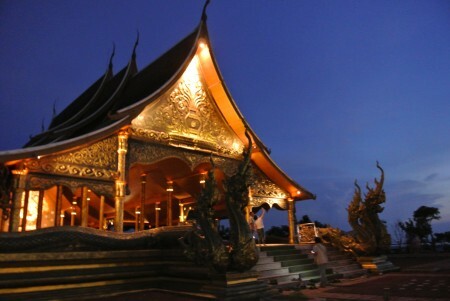 We then had to wait another half hour before it was dark enough to see the temple in all its glory. I had taken some photos when it was light, so I’ll let you compare them. 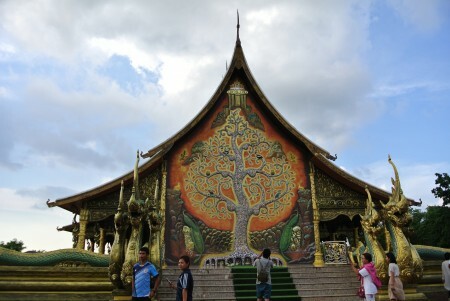 At the back of the temple there is a white tree; Aum explained that it is Yggdrasil from Norse mythology. 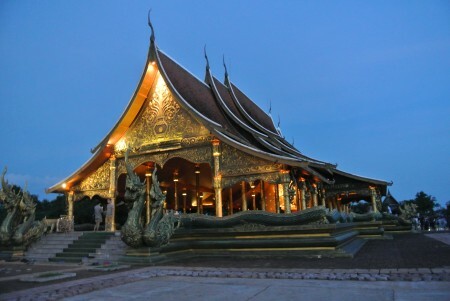 Why it is on a Thai temple, I have no idea. I have a sneaky suspicion Aum was having us on. After we headed back and got McDonalds for dinner. I somehow managed to finish a meal of chips and a chicken sandwich all by myself – even if I was incredibly full after!